Apple's iPad 2 is clearly the market leader, but Samsung has ruffled a few feathers with its upcoming Galaxy Tab 10.1 Android tablet — so much so that Apple has blocked it from going on sale in Australia, and forced Samsung to postpone the launch event. So, what's all the fuss about the Galaxy Tab 10.1, and how does it compare to the iPad 2? Read our comprehensive iPad 2 review and our Samsung Galaxy Tab 10.1 review, and check out our guide to the best upcoming tablets in 2011. For starters, the Samsung Galaxy Tab is thinner and lighter than the iPad 2, despite featuring a larger display. It's also the first Android tablet we've seen that places a huge emphasis on design, both in hardware and software. With this in mind, how does the Samsung Galaxy Tab 10.1 stack up against the Apple iPad 2 when it comes to specifications? The iPad 2 is faster, lighter and 33 per cent thinner than the original iPad. It weighs 613g, and comes in both black and white models. The curved design of the back of the iPad 2 makes it comfortable to hold, and it is relatively thin given the size of its screen. The iPad 2 is ideal for use in either portrait or landscape layouts, and its built in accelerometer rotates quickly and without delay. 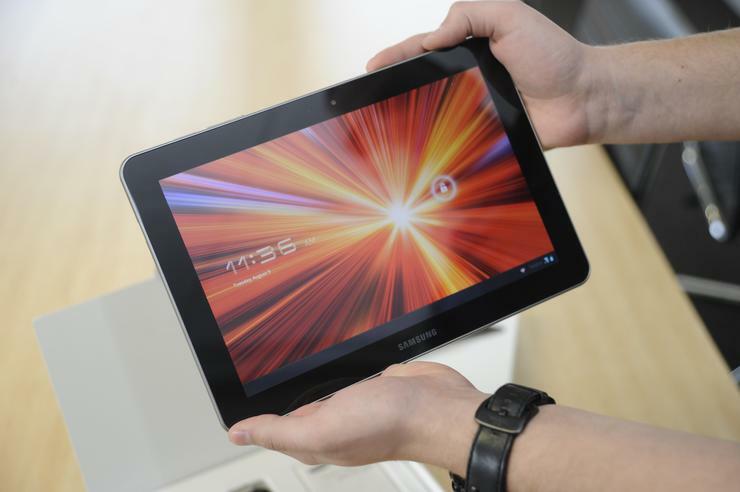 The Galaxy Tab 10.1 is just 8.6mm, thin enough to be described by Samsung as "the world's thinnest mobile tablet". That is ever so slightly thinner than the 8.8mm thick iPad 2. Although a mere 0.2mm doesn't seem like a deal breaker if you're comparing it directly to the iPad 2, the Galaxy Tab 10.1's weight of just 565g is a big deal. The lightweight design makes it easy to use single-handed, and very comfortable to hold for long periods. The Samsung Galaxy Tab 10.1 Android tablet is constructed largely from plastic, but still manages to feel extremely well built. The materials used are of a high quality, right from the glossy black bezel surrounding the display, to the soft-feeling, rubber-style plastic that adorns the rear, and the stylish curved edges. The 9.7in display of the iPad 2 is bright, crisp and clear and really brings content to life, particularly photos and videos. Though the iPad 2 has the same oleophobic screen coating as the iPhone 4, its larger size means a few taps on the display quickly results in a grubby mess that is hard to clean. The iPad 2 also has another serious flaw — its display is virtually impossible to see in direct sunlight, which is a huge issue on a device that's designed for portability and travel. The Samsung Galaxy Tab 10.1 has a slightly larger display at 10.1in, and its resolution of 1280x800 pixels is an improvement over the iPad 2's 1024x768 display. 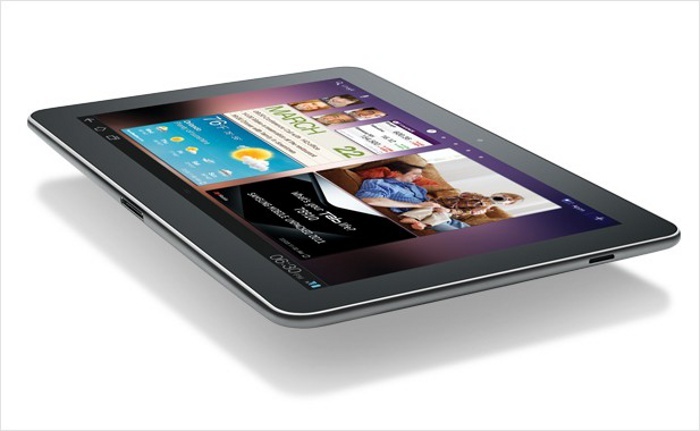 The Samsung Galaxy Tab 10.1's screen uses PLS TFT touchscreen technology. Samsung says that the inclusion of PLS (Plane-line-switching) technology gives the Galaxy Tab 10.1 better viewing angles and increased brightness compared with regular IPS screens. For most part that's true, as the Galaxy Tab 10.1's screen is bright and crisp, and can be clearly seen from even the most obscure angles. Sadly, the screen can't escape a common issue with most tablets, including the iPad 2: it quickly becomes a grubby mess after use, and has poor sunlight legibility. The glare also affects use in an office environment under fluorescent lighting.